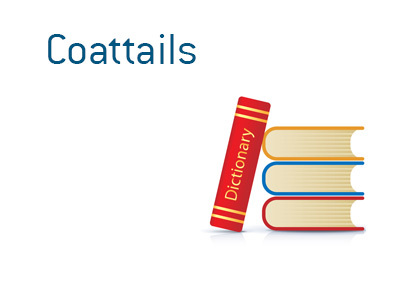 Coattails - What Does It Mean? What does the term "coattails" mean in the world of politics? What is meant by the term "coattails"? In politics, a candidate for a lower office position can "ride the coattails" of a candidate for higher office in order to secure victory. For instance - let's say that there is a terrifically popular candidate running for Prime Minister of a country. This candidate has fresh ideas and a tremendous amount of charisma and ends up winning by a substantial margin. The "halo effect" may send affiliated candidates for lower office positions to victories as well. For instance, a candidate for MP who is in the same party as the Prime Minister may find themselves being catapulted to victory, not based on their own merits but due to the overwhelming popularity of the Prime Minister. The downside for candidates who ride the "coattails" of this fictional Prime Minister is that if the Prime Minister becomes unpopular, the candidates will have practically nothing left to stand on, as they weren't elected based on their own merits. We have seen this in the United States, as many Republicans sought to distance themselves from George W. Bush at the end of his second term in office, for instance. The same phenomenon will likely hold true with the Democrat party as well, as President Obama will likely exit the White House with a low approval rating.